Nokia today announced the latest addition to the Nokia Eseries family of business devices, the Nokia E50. With excellent voice, email and data capabilities, the Nokia E50 offers enterprises a cost-efficient way to extend mobility to a broader range of employees, enabling them to access company telephony and business applications whenever required. Just as importantly the globally-viable Nokia E50 device is easily and securely managed by a company's IT department through Intellisync Device Management solution. With classic Nokia design, the small, sleek, and stylish Nokia E50 is also designed for people who want a single phone for both business and leisure use. For example, the device comes equipped with pre-installed business applications, exceptional voice and calling functionality, and the ability to have two phone numbers in one phone, while lifestyle features include an MP3 player and optionally a 1.3 mega pixel camera all packaged in a discreet glossy metallic case with a touch of color. Built on S60 3rd edition smartphone platform and Symbian OS for enhanced security features and device control, the Nokia E50 supports popular corporate mobile email solutions, including Intellisync Wireless Email by Nokia, BlackBerry Connect, Visto Mobile, Altexia, and Microsoft ActiveSync. 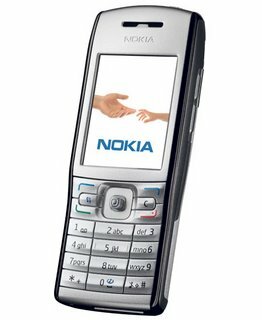 The thinnest Nokia Eseries quad-band phone (EGSM 850/900/1800/1900), the Nokia E50 supports GSM networks worldwide, offering clear phone calls and rich voice and calling functionalities. With up to six hours of talk time, the Nokia E50 offers significantly high battery performance for such a small phone. With the addition of the Nokia E50 to its portfolio of business class devices, Nokia is continuing to expand workforce mobility by offering advanced call features. The add-on business voice solution enables easy integration with an existing business voice infrastructure (PBX). For example, mobile least cost routing helps companies save on long distance and international calls by routing mobile phone calls through the corporate PBX, thereby removing cost barriers associated with business mobility. Companies with Avaya Communication Manager can already connect the Nokia E50 directly to their company phone networks, using the Avaya one-X Mobile Edition client preloaded on their phones. With Avaya client, the Nokia E50 works like a traditional office phone enabling services such as short number usage, call forwarding, one-touch voice mail and extension dialing. In addition, the phone will include a CD featuring a demonstration of the Avaya one-X Mobile Edition, as well as a client installer. The Nokia E50 comes with a set of pre-installed business applications that help increase the productivity of mobile professionals. The Nokia Team Suite, part of the Nokia Office Tools offering, helps to facilitate conference calls and to initiate push-to-talk sessions with selected team members easily and fast, through a built-in speakerphone. The Nokia E50 also includes a search function enabling fast queries into critical data such as, contacts, emails and messages. Important business attachments received via email, such as documents, presentations, and spreadsheets, can be swiftly accessed via the Quickoffice viewer. The Intellisync Device Management offered by Nokia enables remote enterprise grade device management, without additional client software installation, on OMA DM capable devices such as the Nokia Eseries. For IT administrators, an easy-to-use administrative web-interface allows remote management of OMA DM compliant business devices, with access to a device management server located either within a company's own premises or at a service provider's facilities.